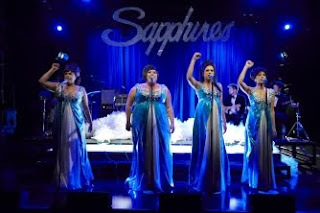 Company B Belvoir and Black Swan Theatre Company present THE SAPPHIRES at the York Theatre, Seymour Centre, Sydney. THE SAPPPHIRES by Tony Briggs and Directed by Wesley Enoch won two Helpmann Awards for Best New Australian Work and Best Play in 2005. This is a revival production that began in January as part of the Perth International Arts Festival and since has toured to several venues in Victoria and after this season here in Sydney, travels internationally to South Korea for a short season. There are plans to make a film of this work. After the success of BRAN NUE DAY let us hope it happens. I saw this work at the Belvoir back in 2005 and enjoyed it very much. This revival, with a mostly new cast, was even better. I had a great time. The opening numbers were dynamically delivered by the four women Hollie Andrew (Julie), Christine Anu (Gail), Casey Donovan (Cynthia), and Kylie Farmer (Kay) accompanied by a very slick and enthusiastic band Simon Burke (Lead musician) Ben Collins (Saxophone), Daniele Di Paola (Drums), and Andrew Weir (Guitar). But it was after the first scene with the women around the laminex table that I thought “I’m going to have a great time tonight!” Mr Enoch had elicited from the actors a clear delineation of character in the ‘classic’ musical theatre genre form and then “cracked a whip” to grasp a classic “comic” timing that was breathless in its pursuit of the right laughs and emotion. The actors were able to sustain this level of skill throughout the show. Balanced with performances of comic pathos by the men in the company: Jimi Bani (Jimmy), Kenneth Ransom (Robby), and particularly Aljin Abella as the wily ‘jack of all trades’, Joe and Oliver Wenn as the good hearted and goofily naïve tour manager, Dave, you have a production that, along with the writing, displays a clever sense of laughter, melodrama and the high jinx of the music without any bathos or cloying sentimentality. Crisp, to the point, informative, political in small capitals and most proudly, celebratory. From the beginning to the end I and my guest had a great time. Based on a true story of an Indigenous female singing group called The Sapphires, formed in Melbourne, that were invited to join a group of entertainers travelling to South-East Asia (Vietnam), to perform for the troops stationed there in 1968, Tony Briggs has created, he says, “a show that (is) fun, theatrically entertaining and something that people of all ages and cultural persuasions could sing, laugh and shake their Mooms to.” Wesley Enoch says “the story of these four women is as iconic as the music they sung. It tells about four sisters taking on the world and rising above anything that tries to limit them – politics, racism, war, the law or personal pain.” It was all that and more. The music has been chosen from the immense resources of the sixties international ‘Girl Group’ pop repertoire, and is there anything more disarming than being able to bop to and indulge in the fun and truths of songs such as RESPECT, MY BOYFRIEND’S BACK, and STOP IN THE NAME OF LOVE ? I’d say “NO!” Add the touching introduction of the song BURA FERA by Theresa Clements of the Yorta Yorta Aboriginal Nation, sung beautifully by the women, and a tribute to Paul Robeson using CONGO LULLABY and the splendiferous James Brown’s SAY IT LOUD I’M BLACK AND I’M PROUD and PEOPLE CAN MAKE THE WORLD A BETTER PLACE and a full emotional experience is delivered, and how. The integration of the true story, the music theatre genre techniques, the well drawn characterisations with accurate and slick direction, topped by enthusiastic musical gifts, a terrific night can happen. It did. Congratulations to all. Auspiciously, Mr Enoch has just being appointed Artistic Director of the Queensland Theatre Company. Good luck. This sounds great - and maybe a good one to take an 11 year old to see? I am so glad I have found your blog.